Angela has recently been working on a collaborative article with Barbara Baptiste for a special Life Care Planning Edition of the esteemed magazine, Brain Injury Professional. We are delighted to announce that this has now been published! 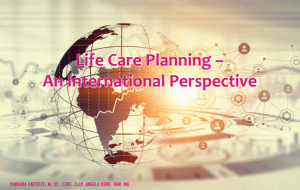 Attached is a PDF copy of this, entitled Life Care Planning- An International Perspective. Please take a read of this brilliant article, which is an enlightening read that focuses on Life Care Planning in both the United Kingdom and Canada. Brain Injury Professional is the official publication of the North American Brain Injury Society, and has the largest professional circulation of any brain injury publication. Please visit their website to find out more, or subscribe to the magazine. Barbara Baptiste is a Certified Life Care Planner and Canadian Certified Rehabilitation Counsellor. She has extensive experience in brain injury case management and she founded Rehabilitation Management Inc in 1987. Please visit her website to find out more.